Show off your best hats in style with these floor standing displays. The best part is that the hats will remain neat and organized, preserving your hats for customer sales. The tiers on most displays spin as one unit to prevent your hats from getting damaged. See individual pictures for designs and call 1-800-426-5708 with any questions. 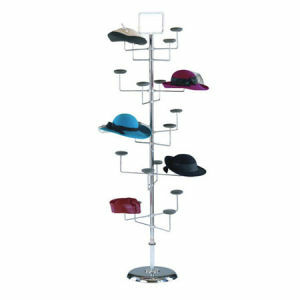 All floor standing hat racks ship direct from the manufacturer and require some assembly.